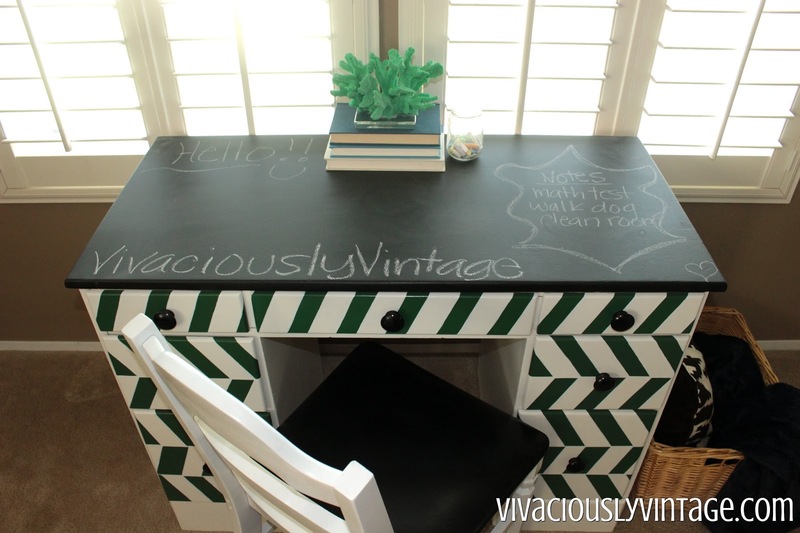 Ansley Designs: Emerald Herringbone & Chalkboard Desk! 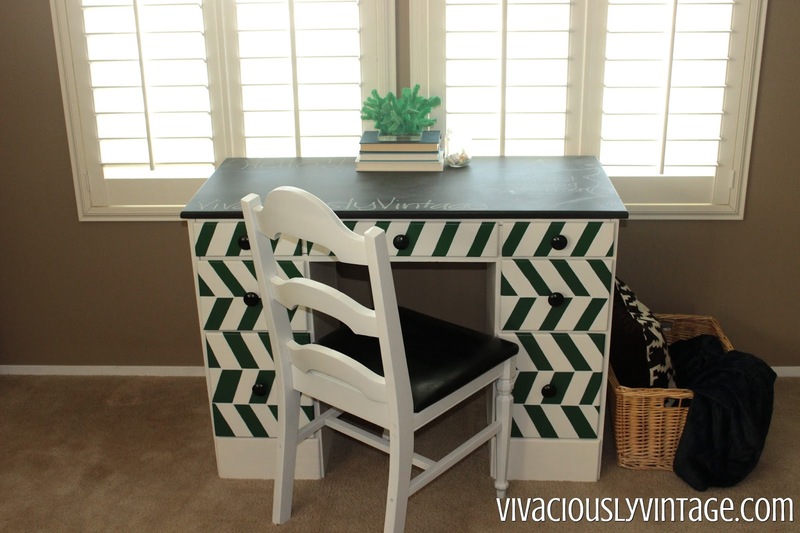 Emerald Herringbone & Chalkboard Desk! This cute kids set is up for grabs for $225! 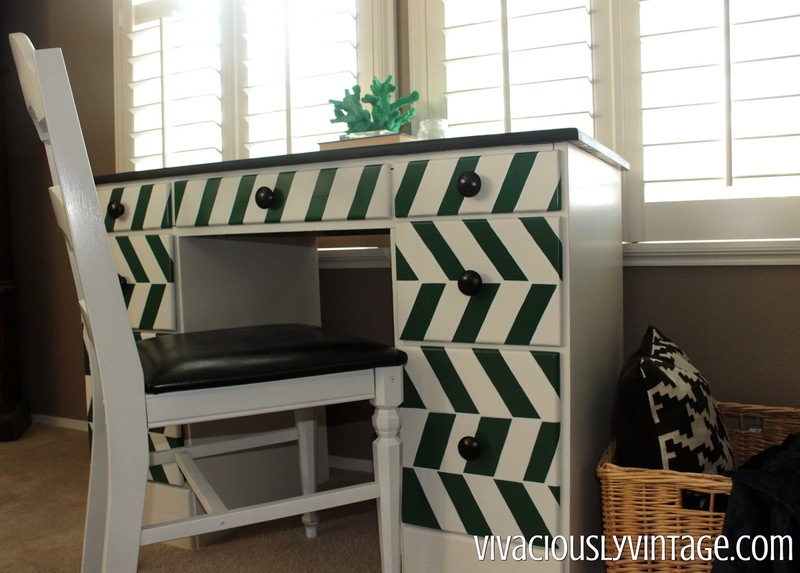 The desk is painted white with an emerald green herringbone pattern on the drawers. 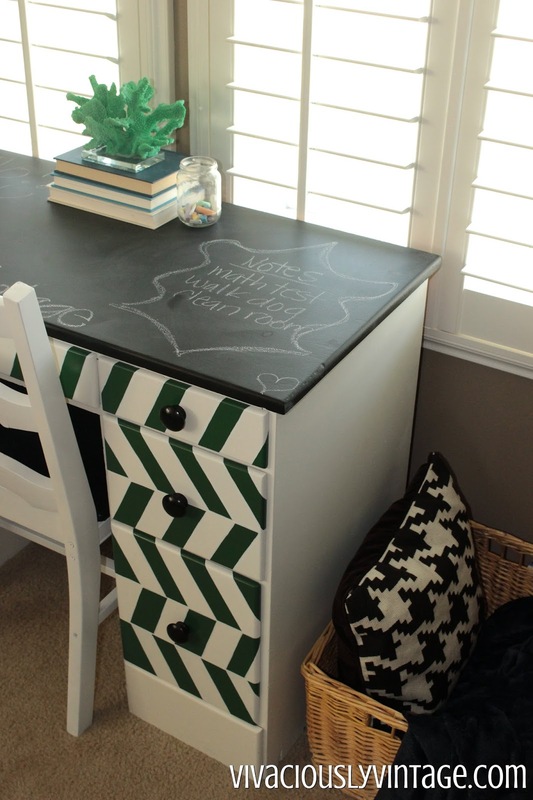 Of course, every kid's desk should have a chalkboard top! The chair is a coordinating black and white, with the seat being the leather type material that is super easy to clean! I'll tell y'all - this pattern took me FOREVER. Not so much in the labor department, but I had to wait a day in between each row of stripes to allow enough drying time for the previous row so the paint wouldn't peel off with the tape! I've made that mistake before! I love that this color combination works perfectly for a boy or a girl! I was originally thinking of putting pretty glass knobs with it, but I wanted it to remain unisex and thought that would make it a bit too girly. That's an easy change if this set ends up being for a little girl! 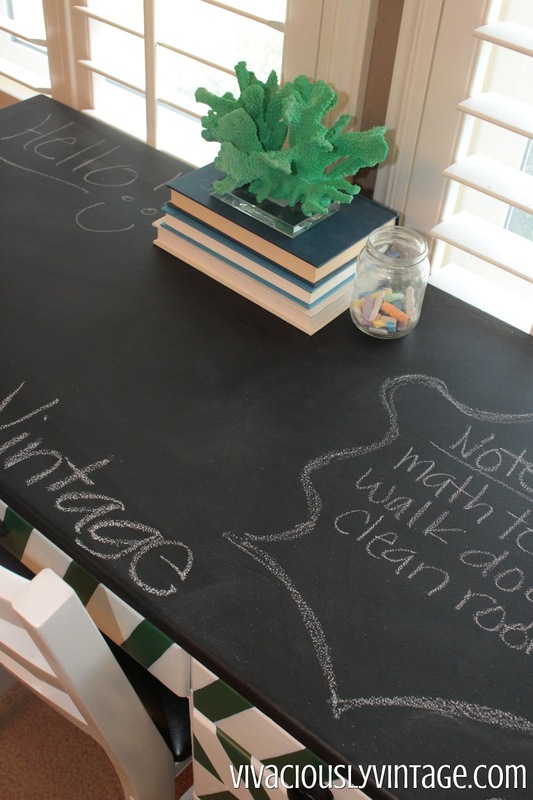 I love chalkboard top desks! I'd venture to say that any kiddo will, too! My son wants to play all over them when I finish a project...and he's 11! I think it's perfect for a small child to draw and play on, and even an older child can use it to take notes and reminders...endless scratch paper! I wish my kiddo would sit at a desk, but when he has homework he just wants to do it in whatever room we are. 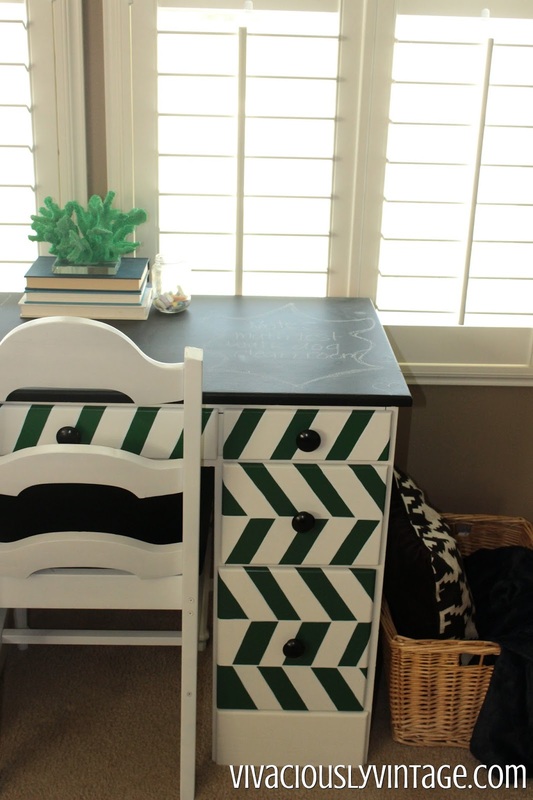 I remember having a desk when I was little, and I loved doing my homework there! It made me feel so grown up and responsible that I had my own work space in my room. Every kid is different, I guess! Anyway, somebody had a lot of fun in these drawers! So, I lined them with a fun black and white diamond pattern. You can still see some of their artwork on the sides in a few places. I even found a picture of a little blonde girl in one of the drawers; I presume she was the artist! $225 for the desk and chair. Measures 42 inches wide, 20 inches deep, and 30 inches tall. Be sure to check out the other stuff in my shop! Haha I love corny puns! My husband just rolls his eyes at mine! Oh MAN I love this! Looks like a lot of patience was needed. 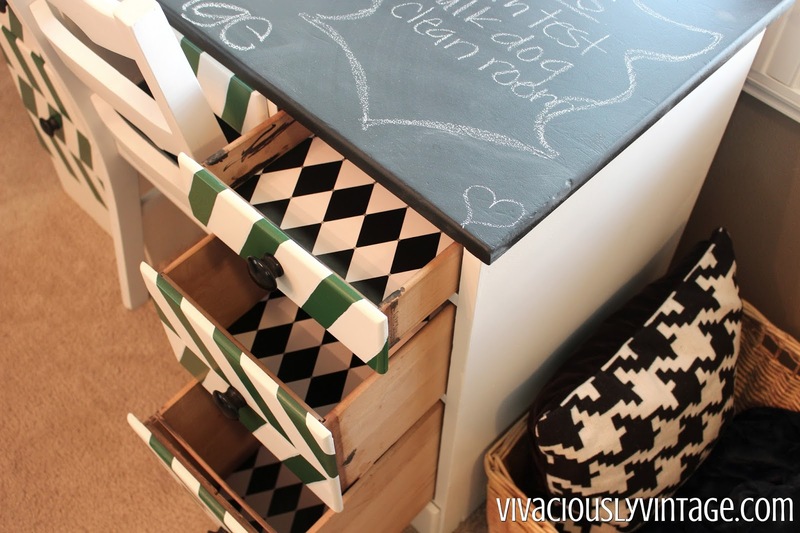 :) Pinning to the Trash 2 Treasure Tuesday board - thanks for sharing! Thank you! The worst part was the waiting! ...but there's always more projects to be done in between!